Home / Health / A fractured system: where do you go when you suddenly need health care? Consider the last time you, a family member, or a friend encountered an unexpected health concern. Did you twist your ankle and weren’t sure if it was broken? Did you develop discomfort in your chest and weren’t sure if it was indigestion or a heart attack? Did your child develop a fever and cough and you weren’t sure if this illness required antibiotics to get better? These are all problems that need the help of health services known as acute care. Where did you turn to get advice and treatment and how did you decide? Was it your doctor’s office, a nearby urgent care center, an emergency department? Were you satisfied with your experience? Navigating the web of care options and weighing the trade offs of these choices about if, when, and where to seek care is complicated. With little price transparency and sparse guidance from the health system, patients facing a health crisis are often left doing their best to make informed decisions. In a recent New England Journal of Medicine article, we tackled the failings of our health system’s responsiveness in addressing the unexpected health care needs of patients and families. Inefficiency, fragmentation, redundancy, and often long waits currently plague acute care. We know that the system is complex and patients frequently don’t know where to start. How can we make it easier to navigate? Fundamentally, solutions begin by placing the patient at the center of the system. What is acute care, and what are its challenges? Where should patients turn when they have an urgent health concern? Via Shutterstock. The ankle injury, episode of chest pain, and sick child scenarios are just a few of the many unexpected health care needs that represent acute care. By one estimate, these needs account for as much as one-third of all outpatient health services delivered in the U.S. Despite being common, there is no well accepted definition for acute care. However, most would agree that acute care encompasses a huge range of problems, from minor injuries and symptoms that may improve on their own to major trauma, patients suffering complications of chronic diseases, and life threatening illnesses. Complicating the situation, people and patients think in terms of symptoms while doctors, nurses, clinics, hospitals, and insurance companies think in terms of diagnoses. As a result, it may be difficult to know the most appropriate setting to care for a particular problem. 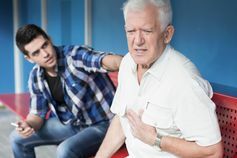 For example, should the patient with chest pain, which could be something simple like indigestion or something life threatening like a heart attack, be seen in the clinic or the emergency department? Acute care must also respond to the needs of those people who are healthy as well as chronically sick, from the young to the old, across all demographic groups in all areas of the country. Because of the diversity of these needs, there is no single place for patients to turn. Instead, there is a patchwork consisting of primary, specialty, and emergency care delivered in such varied settings as doctors’ offices, community health centers, urgent care centers, retail clinics, hospital emergency departments, or increasingly via telehealth strategies. Unfortunately, many of these organizations cannot share records, communicate effectively, or coordinate care with one another. Demand for acute care services is also often unpredictable, since someone’s need for care can occur at any hour of the day on any day of the year. This reality requires some ongoing investment in the costs required to keep buildings open and staffed, whether it is a 24-hour facility like an emergency department or an after-hours clinic. Finally, acute care encompasses the challenge of providing standby capacity to accommodate those situations where there is a public health crisis like an influenza epidemic or local tragedy like a mass shooting. Reflect on what was important the last time you encountered an unexpected health problem. If you’re like most of us, you probably wanted to know whether this problem was minor or serious, was there treatment that should be started, and how to control symptoms. You also probably wanted to know these answers quickly but weren’t sure how best to do this. While there are likely many important considerations to weigh in these moments, people want timely and effective care. However, the decision-making process is complex. For example, people may be considering the different costs of care depending on whether they are uninsured or if they have varying co-pays. Time constraints related to family responsibilities and job obligations could be factors as well. Patients also may be uncertain about whether their symptoms represent minor illness or a more serious condition that could worsen with delay in diagnosis or treatment such as chest pain. Finally, they may be weighing whether it is better to call their doctor’s office in order to maintain continuity with someone they know or seek care from an urgent care or emergency department from someone they generally don’t have an established relationship with. But ultimately, patients seek what acute care doctors and nurses offer: diagnosis, treatment, alleviation of symptoms, and reassurance. So how do we provide these services in a way that’s timely and of high quality? Fifteen years ago, the Institute of Medicine published a landmark report identifying six fundamental aims of high quality health care – that it is safe, effective, patient centered, efficient, equitable, and timely. However, it was only recently that the Institute of Medicine followed up the original publication with a report focused on timeliness, what the authors characterize as the “least well studied and understood” aim of health care. Timely care will only become a priority if clinics, hospital emergency departments, doctors and nurses, and health systems face financial or reputational consequences for unfair delays in responding to patients’ acute needs. Currently there is little accountability to adopting timeliness as a universal value in health care. Many will point out that resources are limited, making waits in health care common and inevitable. However, solutions requiring few additional resources can often be developed with improved planning and more rational scheduling. Adopting a more comprehensive approach to organizing care that allows for innovation and sharing of successful strategies across practices and communities will also catalyze improvement. One example of this approach from the Netherlands is the creation of a pool of after-hours care by banding together doctors’ offices into large scale cooperatives. Hampering efforts to improve timeliness of acute care is the lack of measurement standards that permit accurate evaluation of those aspects of acute care that are meaningful to patients. Change can be accelerated by linking payment for care to performance on these measures. For example, hospitals and health systems would be at risk for reduced payment if they failed to see patients in the clinic or emergency department in timely fashion, or if patients had substandard recovery to health after their acute illness. Finally, acute care must be fully integrated into health reform efforts that have so far primarily emphasized improving care for chronic disease and hospital stays. Yet acute illness represents a substantial responsibility for the U.S. health care system. The focus should be on getting the most value for the services that patients receive when they seek care for their unexpected health needs. This includes getting proper care quickly at reasonable cost. Given the fractured manner in which acute care is commonly delivered, it is important for the health care system as a whole – from clinics to emergency departments – to be ultimately responsible for making this care timely while still delivering on quality. We all know that timeliness in health care matters to people. Solutions begin by placing patients at the center of the health care system.